These savory potatoes are easy to prepare and roast, and a combination of Parmesan cheese, olive oil, and garlic. The thyme helps flavor the potatoes but feel free to change up the seasonings. Use some oregano and basil or add more garlic. See the tips and variations for more ideas. The potatoes come out crisp on the outside and tender on the inside. For even browning and crisping, turn the potatoes about every 15 minutes. Preheat the oven to 400 F (200 C/Gas 6). Line a large rimmed baking sheet (jelly roll pan or half sheet pan) or roasting pan with foil. Lightly oil the foil. In a plastic food storage bag or large bowl combine the cubed potatoes with the olive oil, seasonings, thyme, and Parmesan. Toss to coat thoroughly. Spread the potatoes out in a single layer in the prepared baking pan and roast in the preheated oven for 55 to 60 minutes, until nicely browned, turning 3 or 4 times with a spatula throughout the roasting time. Parmesan Roasted Potatoes With Parsley: Omit the thyme and toss the potatoes with 2 tablespoons of fresh chopped parsley when they come out of the oven. 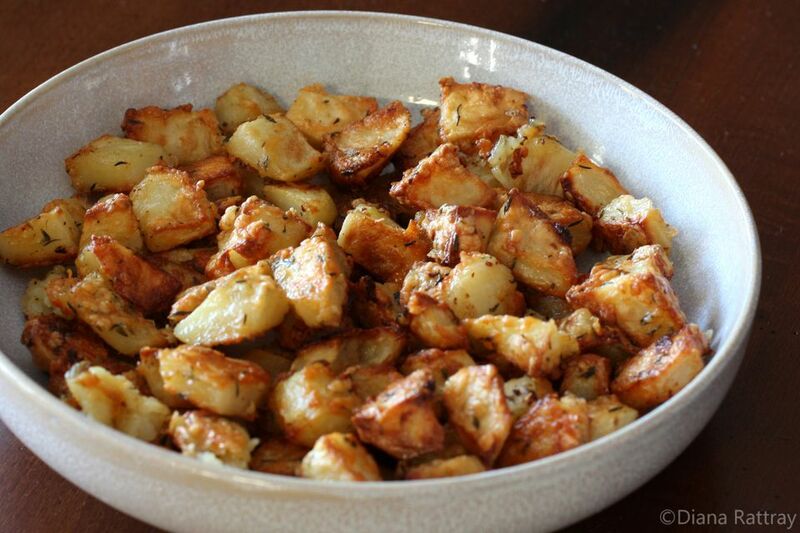 Garlicky Parmesan Roasted Potatoes: Add 4 cloves of finely minced fresh garlic to the potatoes with the olive oil. Italian Herb Parmesan Roasted Potatoes: Add 1/2 teaspoon of dried leaf oregano and 1/2 teaspoon of dried leaf basil along with the thyme. Replace part or all of the olive oil with melted duck fat or canola oil.